While too much of the sun’s warm rays can be harmful to your skin, the right balance can have lots of mood lifting benefits. Sunlight and darkness trigger the release of hormones in your brain. Exposure to sunlight is thought to increase the brain’s release of a hormone called serotonin. This is associated with boosting mood and helping a person feel calm and focused. At night, darker lighting cues trigger the brain to make another hormone called melatonin. This hormone is responsible for helping a person feel sleepy and go to sleep. A mood boost isn’t the only reason to get increased amounts of sunlight. 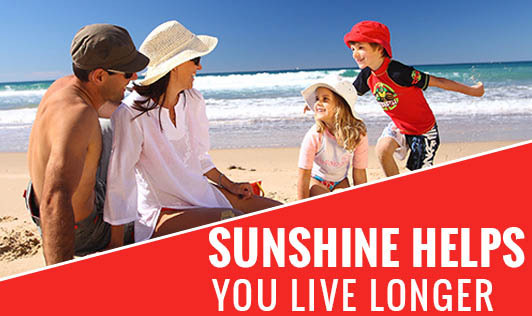 There are a number of health benefits associated with catching a moderate amount of rays. According to the Mayo Clinic, decreased sun exposure has been associated with a drop in serotonin that can lead to SAD. You’re more likely to experience SAD in the winter when the days are shorter and the nights are longer. One of the treatments for SAD is light therapy, which is also known as phototherapy. A doctor can recommend a special light box designed to stimulate the brain to make serotonin and reduce excess melatonin production. Exposure to sunlight can also benefit those suffering from nonseasonal depression, premenstrual dysphoric disorder, and in pregnant women with depression, according to the Journal of Psychiatry & Neuroscience. Anxiety-related disorders and panic attacks have also been linked with changing seasons and reduced sunlight. The light-induced effects of serotonin are triggered by sunlight that goes through the eye. Sunlight cues special areas in the retina, which triggers the release of serotonin. The sun’s benefits go beyond just fighting stress. While researchers don’t always have an exact measurement for how long you should stay outside to reap these benefits, the following are some of the other reasons to catch some rays. Exposure to the ultraviolet-B radiation in the sun’s rays causes a person’s skin to create vitamin D. The vitamin D made thanks to the sun plays a big role in bone health. Low vitamin D levels have been linked to rickets in children and bone-wasting diseases like osteoporosis and osteomalacia. According to the World Health Organization, sun exposure can treat several skin conditions for the right person. Doctors have recommended UV radiation exposure to treat psoriasis, eczema, jaundice, and acne. While light therapy isn’t for everyone, a dermatologist can recommend if light treatments will benefit your skin concerns. However, more research needs to be conducted before sunlight can be a conclusive treatment for these and other conditions. While there are lots of good reasons to get sun for mood, the sun’s rays do have ultraviolet (UV) radiation. The sun’s rays can penetrate the skin and damage cell DNA. This can lead to skin cancer. Defining an excess amount of sun exposure depends upon your skin type and how direct the sun’s rays are. Fairer skinned people typically get a sunburn more quickly with sun exposure than others who are darker skinned. Also, a person is more likely to get a sunburn going outside when the sun’s rays are more direct. This usually takes place between 10 a.m. and 4 p.m. According to the World Health Organization, getting anywhere from 5 to 15 minutes of sunlight on your arms, hands, and face two to three times a week is enough to enjoy the vitamin D-boosting benefits of sun. Note that the sun actually has to penetrate the skin — wearing sunscreen and/or clothing over the skin won’t result in vitamin D production. If you’re going to be outside for more than a brief 15-minute period, it’s a good idea to protect your skin. You can do that by applying a sunscreen with a sun protection factor of at least 15. Wearing a protective hat and shirt can also help. Adding a little sunshine to your life by getting outside more can relieve anxiety and reduce depression. If you live in higher latitudes with little sunlight, a light box may provide some mood-boosting benefits. From treating skin conditions to strengthening bones, sunlight has other health benefits as well. Because excess sun exposure is linked with increased skin cancer risk, refrain from staying outside too long without sunscreen. If you’re going to be outside longer than 15 minutes or so, you’ll need a sunscreen with an SPF of at least 15.